The blind mole rat (Spalax typhlus) has tiny eyes completely covered by a layer of skin. They are vestigial organs in comparison with the presumably functional eyes of the rat's ancient ancestors. In evolutionary biology and comparative anatomy, "vestigiality" in a species describes organs (vestigial organs), structures (vestigial structures), behaviors, and biochemical pathways that have seemingly lost all or most of an original function present in ancestor species. These structures are typically in a degenerate, atrophied, or rudimentary condition, and are often called vestigial organs, despite some of them not being actual organs. Examples include the eyes of some cave dwelling fish and mole rats, the leg and hip bones found in whales, the teeth that quickly disappear in duck billed platypuses, pollen in dandelions, and the human appendix and wisdom teeth. Although structures deemed "vestigial" are often identified as largely or entirely functionless, in modern conceptions of the term in evolutionary biology, a vestigial structure may still retain lesser functions. This broader definition (versus no function), as well as the use of vestigial organs as one of the main arguments toward evolutionary theory, has led to significant debate between evolutionists and creationists. Religious adherents may accept the reality of vestigial organs as evidence of descent with modification without accepting natural selection as the main causal agent of large scale changes (macroevolution). Prior to the theory of Darwinian evolution, the reason for the existence of vestigial structures was long speculated upon. In the fourth century B.C.E., Aristotle commented in his History of Animals on the vestigial eyes of moles, which lack pattern recognition due to a layer of skin that completely covers them. Despite this long-held curiosity, it is only in recent centuries that anatomical vestiges have become a subject of serious study. In 1798, Étienne Geoffroy Saint-Hilaire hypothesized that vestigial structures exist because nature leaves vestiges of an organ as long as it plays an important role in species of the same family. His colleague, Jean-Baptiste Lamarck, also researched vestigial structures, naming a number of them in his 1809 book, Philosophie Zoologique. 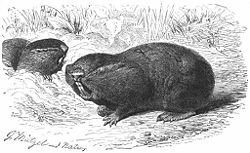 Lamarck speculated that Guillaume-Antoine Olivier's blind mole rat Spalax had lost its eyesight because it rarely came in contact with daylight, thus leaving behind vestiges of the unnecessary organs and passing on these traits to its offspring. Thus, he advocated the once popular concept of inheritance of acquired characters, or that the individual efforts of an organism during its lifetime were the main mechanism driving species to adaptation. Several decades later, the inheritance of acquired characters concept was largely diminished by Charles Darwin's theory of natural selection, which used such presumed vestigial structures as the muscles of the ear, wisdom teeth, the appendix, the tail bone, body hair, and the semilunar fold in the corner of the human eye as evidence for his theory. He also made the important distinction in The Origin of Species (1859), that if a structure had lost its primary function, but still retained secondary anatomical roles, it could still be described as vestigial. The human vermiform appendix was identified by Charles Darwin as a vestigial structure based on its having no known function. Scientists later discovered that the appendix plays a role in the immune system and the identification of the appendix as being vestigial has become a point of contention. In the late nineteenth century, Robert Wiedersheim published a list of 86 human organs that, he claimed, had lost their original function. He then labeled them vestigial, theorizing that they were vestiges of evolution. Since the publication of his list, the true function of some of these structures has been discovered, while other anatomical vestiges have been unearthed, resulting in the use of the list as a record of the knowledge of human anatomy at the time. Later, versions of Wiedersheim's list were expanded to as many as 180 human "vestigial organs," which was later referenced in the landmark Scopes Monkey Trial by the zoologist Newman, as evidence of evolution (Briney). Currently, the term vestigial organ is used in the media to refer to a wholly useless organ, while it retains Darwin's functional distinction in evolutionary biology. The fact that vestigial structures reveal a similarity in structure and position with organs in presumed ancestors, but lack the function found in the ancestors, can be considered evidence for evolution—specifically, the "theory of descent with modification," or "theory of common descent." That is, vestigial organs support the view that all organisms have descended from common ancestors by a continuous process of branching; in other words, all life evolved from one kind of organism or from a few simple kinds, and each species arose in a single geographic location from another species that preceded it in time. The presence of a vestigial organ suggests a shared ancestry with another organism that has similar, but functional organs. The "theory of natural selection" offers a proposed mechanism by which vestigial organs can come about. That is, the existence of vestigial organs may be hypothesized as resulting from changes in the environment and behavior patterns of the species in question. As the function of the structure is no longer beneficial for survival, the likelihood that future offspring will inherit the "normal" form of the structure decreases. In some cases, the structure becomes detrimental to the organism (for example the eyes of a mole can become infected (Darwin 1859)). In many cases, while the structure may not be directly harmful, all structures require extra energy to build and maintain, providing some selective pressure for the removal of parts that do not contribute to an organism's fitness. A structure that is not harmful is theorized to take longer to be phased out by natural selection than one that is. Darwin's theory of descent with modification remains the most widely accepted scientific theory regarding why such organs exist, with Darwin's theory of natural selection the most widely accepted scientific theory regarding how such organs came about. However, technically, vestigial organs only strongly support the theory of descent with modification (the non-causal "pattern" of evolution between ancestral and descendant taxa), not the theory of natural selection (the "process" by which evolution took place to arrive at the pattern). It is often stated that vestigial versions of a structure can be compared to the original version of the structure in other species in order to determine the homology of a vestigial structure, and that homologous structures indicate common ancestry with those organisms that have a functional version of the structure. However, technically, the presence of homology, as currently defined, does not offer evidence of common descent. That is because homology is commonly defined as any similarity between structures that is attributed to their shared ancestry. Anatomical structures that are similar in different biological taxa (species, genera, etc.) would be termed homologous if they evolved from the same structure in some ancestor. It would be incorrect to state that homology, as presently defined, provides evidence of evolution because it would be circular reasoning, with homology defined as similarity due to shared ancestry. Letter c in the picture indicates the undeveloped hind legs of a baleen whale. There are numerous examples of vestigial organs in the animal kingdom. In whales and other cetaceans, one can find small vestigial leg bones deeply buried within the back of the body. The evolutionary explanation is that these bones are the remnants of their land-dwelling ancestor's legs. Many whales also have undeveloped, unused, pelvis bones in the anterior part of their torsos, added remains from their land-dwelling ancestors (LiveScience.com). Several flightless birds, including Dodo birds (now extinct) and penguins, have hollow bones, a feature usually reserved for flying birds (since the weight reduction is crucial to staying in the air). Thus, these hollow bones are explained by evolution to be the remnants of a flying ancestor. The wings of emus, and some other flightless birds, like the dodo, are often identified as vestigial as well, much like the hollow bones. However, there is a difference with penguins. While penguins' wings are not used for flight, they are essential for the penguin to be able to navigate underwater (they essentially act as flippers). Thus, penguin wings are often not identified as vestigial, since they have gained an essential function that has not been found in any ancestral state (Theobald, 2004). The eyes of certain cavefish, like the blind [[fish] Astyanax mexicanus, are also vestigial, presumably as a result of living in total darkness. While the fish are developing in their eggs, their newly formed eyes start to degenerate, until the fish is left with the collapsed remnant of an eye, covered by a flap of skin. These are thought to be the remnant of their ancestors' functional eyes (LiveScience.com). The modern-day duck-billed platypus is said to have vestigial teeth, which it quickly loses in early life, resulting in gums that are more suited for scooping crustaceans and worms out of riverbeds. While fossil records of prehistoric platypus ancestors are not extensive, the fossils that have been found show platypus-like creatures with rows of teeth, thus adding to evolutionists' arguments (Folger 1993). The muscles connected to the ears of a human do not develop enough to have the same mobility allowed to monkeys. Although the list of human presumed vestigial structures has remained essentially the same over time, the relative usefulness of certain structures on the list is a continuing subject of debate. The following are some of the structures often included in this list. The vermiform appendix is an appendage of the cecum, the ascending colon. According to the speculations of evolutionary biologists, the vermiform appendix may have been used by humans' herbivorous ancestors to digest cellulose. The large appendix of the rabbit is often identified as an example of the original nature and use of the organ. 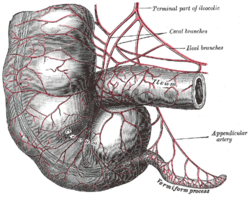 The modern functionality of the appendix is still controversial in the field of human physiology, although evidence has been uncovered for certain useful functions of the appendix in both fetal and adult humans, such as producing important compounds in fetuses (biogenic amines and peptide hormones), working as a lymphatic organ in adult with immune function, and a safe haven for useful bacteria (Rowland 2007; Zahid 2004; AP 2007). The evidence of these functions calls into question the designation of the vermiform appendix as a vestigial organ. The coccyx, or tailbone, is thought to be the remnant of a lost ancestral tail, selected out as humans began to walk increasingly upright. All mammals have a tail at one point in their development; in humans, it is present for a short time during embryonic development. The tailbone, located at the end of the spine, serves as an attachment point for muscles, but it does not assist in balance and mobility as do the tailbone and tail of many mammals. In rare cases the human embryonic tail can persist after birth and must be surgically removed (LiveScience). The plica semilunaris is the small, pink fold of tissue on the inside corner of the eye. It is claimed to be the vestigial remnant of the nictitating membrane (or the clear "third eyelid"), which is fully present in other animals, and which can be controlled to protect the eye from debris and moisture loss, while still allowing the animal to see. It forms while a human is an embryo, but then declines afterward until it is only present in the corner of the eye. Whether or not this structure is vestigial is a matter of popular controversy, partially due to the interpretation of the word vestigial to mean useless. This is because the plica semilunaris in humans currently serves the important purpose of cleaning out dust and other particles from the eye, resulting in a common crusted mucus. However, evolutionary biologists claim that it evolved from the nictitating membrane found in other animals, and is thus vestigial (Thompson 1956). Wisdom teeth were identified by Darwin as being vestigial third molars that human ancestors used to help in grinding down plant tissue. It has been postulated that the skulls of human ancestors had larger jaws with more teeth, which were possibly used to help chew down foliage to compensate for a lack of ability to efficiently digest the cellulose that makes up a plant cell wall. As human diets changed, it is posited, a smaller jaw was selected by evolution, yet the third molars, or "wisdom teeth," still commonly develop in human mouths, often leading to extractions (Johnson, 2006). Evolutionary biologists also state that humans bear some vestigial behaviors and reflexes. For example, the formation of goose bumps in humans under stress is considered a vestigial reflex from the view that human evolutionary and more hairy ancestors are believed to have used the goose bumps reflex to raise the body's hair, making the ancestor appear larger so as to help scare off predators. Raising the hair also could be used to trap an extra layer of air, keeping an animal warm. This reflex formation of goosebumps when cold is not vestigial in humans, but the reflex to form them under stress is considered to be so (LiveScience.com). In the case of the ear muscles of a human, it is believed that a function once provided by one structure has been replaced by another. 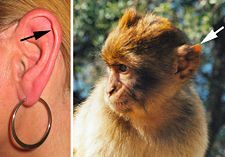 The ears of a Macaque monkey and most other monkeys, have muscles that are more developed than those of humans and therefore have the capability to move their ears to better hear potential threats (Macalister 1871). In humans, the inability to move the ears is compensated mainly by the ability to turn the head on a horizontal plane, an ability which is not common to most monkeys (Mivart 1873). Delving deeper into vestigiality arguments, there are also thought to be vestigial molecular structures in humans, which are no longer in use but may indicate common ancestry with other species. One example of this is L-gulono-gamma-lactone oxidase, a gene found to be functional in most other mammals, which produces a Vitamin C-catalyzing enzyme. In humans, an earlier mutation may have caused it to become disabled (unable to produce the enzyme), and it now remains in the human genome only as a vestigial genetic sequence (Theobald 2004). Vestigial structures are found not only in animals; plants are also said to have vestigial parts. Dandelions and other asexually reproducing plants retain flowers, and produce pollen, both of which are only necessary for the process of sexual reproduction. Also, grass often has small, undeveloped structures that strongly resemble those of flowering plants (Knobloch 1951). The concept of vestigial organs as supporting evidence for evolution is opposed by creationists in the narrower sense of creationism that does not allow descent with modification or evolution by natural selection. A common point of contention between creationists in this sense and evolutionists is the actual definition of vestigial. Creationists often define vestigial organs as having no purpose, whereas evolutionists view vestigial organs as those that have lost their primary function, but are not necessarily functionless (Bergman and Howe 1990). (This contradiction is shown above, in the examples of the appendix and plica semilunaris.) Thus, based on these opposing definitions, some creationists believe that there are no true vestigial organs, because some function can be discerned and because God is considered to have had a specific plan and purpose for all the structures of living beings. It is also argued that over 100 years ago, scientists made claims that certain structures, such as the tonsils, were vestigial, simply because medical science had not advanced to the point where the function of the tonsils could be well understood. Today, the function of the tonsils in disease prevention has been identified, and creationists use this as further evidence in the case against vestigial organs (Oktar 2007). Another common argument is that the observed similarity of structures between species essentially proves nothing. Creationists maintain that such structures, as observed, can indicate a repeated, effective model put in place by God in different species. They also point out that some organs, such as the appendix, are present in apes and humans, but not in the lower apes, and then appear again in even lower animals, such as opossums. Such gaps in the presumed chain of evolution (the gap being the lower apes) indicate evidence in their view of logical flaws in the theory of evolution, further showing that similar organs do not provide evidence of evolution, but instead creationism (Oktar 2007). At the same time, some branches of creationistism will allow for microevolution (variations in individual species) but not macroevolution (speciation or higher changes, such as the origin of new designs). Thus, the existence of vestigial traits as support of microevolution is not opposed, but their use as an argument in support of macroevolution is opposed (Long 2004). Religious adherents who accept the reality of descent with modification, but not natural selection as the main causal agent of macroevolutionary change, do not find conflict with the concept of vestigial structures as evidence for evolution (in the sense of descent with modification). Rather, they view newer creations coming on the foundation of earlier creations. Aristotle. 2007. History of Animals. D’Arcy Wentworth Thompson, trans. ebooks@adelaide. Retrieved November 25, 2007. Bergman, J., and G. Howe. 1990. Vestigial Organs Are Fully Functional. Kansas City: Creation Research Society Books. ISBN 0940384094. Briney, P. Hall of shame for evolution fraud and deceit. University of Arkansas. Retrieved November 25, 2007. Folger, T. 1993. A platypus in Patagonia: Ancient life. FindArticles.com. Retrieved November 25, 2007. Johnson, G. B. 2007. Evidence for evolution (Page 12). Txtwriter Inc. Retrieved November 25, 2007. Knobloch, I. 1951. Are there vestigial structures in plants? Science 113: 465. Lamarck, J.-B. 1809. Philosophie zoologique. Ou exposition des considérations relatives à l'histoire naturelle des animaux. LiveScience.com. n.d. Top 10 useless limbs (and other vestigial organs). Imaginova Corp. Retrieved November 25, 2007. Long, J. T. 2004. Micro vs. macro evolution: Objections against creation. TrueAuthority.com. Retrieved December 1, 2007. Macalister, A. 1871. Myology of the chimpanzee and other primates. Annals and Magazine of Natural History 7: 342. Mivart, S. G. J. 1873. Lessons in Elementary Anatomy. London: Macmillan. Muller, G. B. 2002. Vestigial organs and structures. Pages 1131-1133 in M. Pagel, ed., Encyclopedia of Evolution. New York: Oxford University Press. ISBN 0195122003. Oktar, A. 2007. The myth of vestigial organs. Darwinism Refuted.com. Retrieved November 25, 2007. Reeder, A., and J. Wilcox. 1997. Evolution. Bioweb. Retrieved November 25, 2007. Rowland, R. 2007. What is the function of the human appendix? Did it once have a purpose that has since been lost? Scientific American. Retrieved November 1, 2007. St. Hilaire, G. 1798. Observations sur l'aile de l'Autruche, par le citoyen Geoffroy. La Decade Egyptienne, Journal Litteraire et D'Economie Politique 1: 46-51. Theobald, D. 2004. 29+ Evidences for macroevolution. Talkorigins.org. Retrieved November 25, 2007. Thompson, W. R. 1956. Introduction to the Origin of Species by C. Darwin. London: J. M. Dent and Sons. Wiedersheim, Robert. 1895. The Structure of Man: An Index to His Past History. London: Macmillan and Co. This page was last modified on 6 February 2009, at 19:33.